Imperial College Healthcare NHS Trust; Senior Clinical Policy Adviser, Arthritis Research UK, London. Leeds Institute of Rheumatic and Musculoskeletal Medicine, University of Leeds, and NIHR Leeds Biomedical Research Centre, Leeds. An ageing, increasingly overweight/obese population means this burden will continue to increase. Critically, musculoskeletal conditions are major contributors to multimorbidity because of their prevalence, impact on quality of life, and because they deprive people of their mobility and independence, interfering with management of other conditions. IS THERE A FEASIBLE SOLUTION? This enormous problem of arthritis and multimorbidities comes at a time of unprecedented need for and demand upon NHS services, coupled with a historic financial challenge. Care for people with long-term conditions needs to move towards personalised, integrated systems of care, with emphasis on supported self-management, for example, through care and support planning, and shared decision making.9 The NHS Five Year Forward View articulated the challenges to the NHS in supporting the increasingly complex health needs of an ageing society.10 This led to multiple initiatives linking health, social care, and public health approaches including local devolution experiments, and the creation of the sustainability and transformation partnerships. There are limited treatment options for the GP supporting a patient with arthritis and back pain. Although pharmacotherapies are commonly used, their toxicities are considerable, especially in the context of multimorbidity.11,12 However, there is increasing doubt about their efficacy, and overmedicalisation is an important barrier to self-management.13 Muscle-strengthening and activity-related exercises are very effective in reducing osteoarthritis and back pain, and improve everyday functioning and mobility; there are few adverse side effects and many potential additional benefits, for example, cardiovascular, mental health, and overall wellbeing;14 this approach is supported by systematic literature reviews and NICE recommendations.15,16 Though physical activity programmes are widely available, these often do not meet the needs of people with painful musculoskeletal problems. Also, such programmes have often not been part of a coordinated local approach, building on community assets. Given their prevalence, impact, and the underpinning risk factors amenable to relatively simple activity interventions, a comprehensive public health approach to painful musculoskeletal conditions is therefore warranted. Providing Physical Activity Interventions for People with Musculoskeletal Conditions is a new report to support local commissioners and providers of health and wellbeing services, including NHS and local authorities, in taking action to improve musculoskeletal health locally.17 It was co-produced by Arthritis Research UK, the Department of Health, Public Health England, and NHS England; it has been endorsed by the Royal College of General Practitioners, the Chartered Society of Physiotherapy, and the Local Government Association. It provides information and practical solutions for local physical activity provision, includes a focused checklist to enable local decision makers to map, and highlight any gaps in, current levels of physical activity provision. The report reviews the extensive and well-established benefits of physical activity both for people with musculoskeletal conditions and wider society. 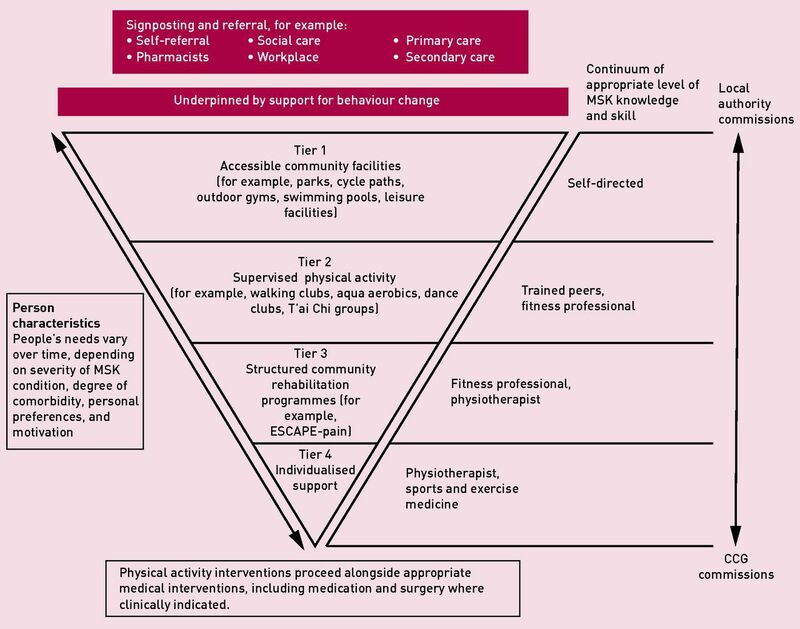 At the heart of the report is a tiered approach (Figure 1) providing a framework to support people with these conditions to benefit from physical activity. Commissioning physical activity provision for people with musculoskeletal conditions. Many people with reasonable mobility can benefit from self-directed physical activity using accessible community facilities, so long as staff are aware of, and facilities equipped for, the needs of people with musculoskeletal conditions. Others will benefit from supervised physical activity, including land-and water-based exercise groups, such as T’ai Chi, pilates, walking groups, or aqua aerobics. There are a number of principles underpinning the higher-tiered interventions. Improving muscle strength is a basic construct: if someone can’t undo a jar or get out of a chair easily, they have significant muscle weakness and it will be fruitless expecting them to join a walking group. They will need a much more structured approach, akin to cardiac or pulmonary rehabilitation. One such approach for lower-limb joint pain is the ESCAPE-pain programme, a 6-week, 12-visit intervention, which provides both self-management principles and supervised instruction in appropriate leg-strengthening exercises. It has been demonstrated not only to be effective in terms of pain and functioning outcomes in clinical trials, but also to be cost-effective in the UK setting. Of course, some people will need individualised supervised support with prescribed exercises from physiotherapists. Which tier is appropriate for a given individual? This needs to be a shared decision between the person with arthritis or back pain and those supporting them, who can be any care provider including GPs, allied health professionals, health trainers, fitness professionals, or peers. People’s personal preferences are important and their physical activity provision needs vary over time as their health changes. All this must be supported by local systems for behaviour change. engage local authority and clinical commissioners to adopt a public health approach,19 undertaking local review of musculoskeletal health need and ensuring physical activity provision in line with this report, particularly ensuring access to ESCAPE-pain. The authors thank all those who contributed to the report entitled Providing Physical Activity Interventions for People with Musculoskeletal Conditions, especially Anna Garratt and Tim Marshall. Philip G Conaghan is supported in part by the National Institute for Health Research (NIHR) Leeds Biomedical Research Centre. The views expressed in this publication are those of the authors and not necessarily those of the NHS, the NIHR, or the Department of Health. (2013) Osteoarthritis in general practice. (2017) State of musculoskeletal health. (2009) Musculoskeletal Matters, What do general practitioners see? Bulletin 1:pp 1–2. National Joint Registry Editorial Board. (2016) 13th annual report 2016 National Joint Registry for England, Wales, Northern Ireland and Isle of Man Surgical data to 31 December 2015, Part 2. Clinical activity 2015 and using the dedicated NJR Reports website. (NJR). (2016) Global, regional, and national incidence, prevalence, and years lived with disability for 310 diseases and injuries, 1990–2015: a systematic analysis for the Global Burden of Disease Study 2015. Lancet 388(10053):1545–1602. (2014) NHS England 2013/14 CCG programme budgeting benchmarking tool, https://www.england.nhs.uk/resources/resources-for-ccgs/prog-budgeting/ (accessed 31 Aug 2017). (2016) Sickness absence in the labour market: 2016 (ONS). (2013) The personal and national costs of lost labour force participation due to arthritis: an economic study. BMC Public Health 13(1):188. (2013) Delivering better services for people with long-term conditions: building the house of care (King’s Fund, London). (2014) Five year forward view. (NHS England), https://www.england.nhs.uk/five-year-forward-view/ (accessed 31 Aug 2017). (2015) Efficacy and safety of paracetamol for spinal pain and osteoarthritis: systematic review and meta-analysis of randomised placebo controlled trials. BMJ 350:h1225. (2017) Non-steroidal anti-inflammatory drugs for spinal pain: a systematic review and meta-analysis. Ann Rheum Dis 76(7):1269–1278. (2017) Br J Gen Pract, Barriers to self-management of chronic pain in primary care: a qualitative focus group study. DOI: https://doi.org/10.3399/bjgp17X688825. (2015) Br J Gen Pract, Determinants of health-related quality of life in older primary care patients: results of the longitudinal observational AgeCoDe Study. DOI: https://doi.org/10.3399/bjgp15X687337. (2016) Low back pain and sciatica in over 16s: assessment and management. NG59 (NICE, London) https://www.nice.org.uk/guidance/ng59 (accessed 7 Sep 2017). (2014) Osteoarthritis: care and management. CG177 (NICE, London) https://www.nice.org.uk/guidance/cg177 (accessed 7 Sep 2017). (2017) Providing physical activity interventions for people with musculoskeletal conditions (Arthritis Research UK). (2014) Using health trainers to promote self-management of chronic pain: can it work? Br J Pain 8(1):27–33. (2014) A public health approach to musculoskeletal health. Best Pract Res Clin Rheumatol 28(3):517–532.